On June 14, the host Russia played the first match with Saudi Arabia in Moscow to kick off 2018 FIFA World Cup. What we concern most before the start of Russia 2018 is the opening ceremony. Robbin Williams sang alongside Russian soprano Aida Garifullina and Brazilian great player - Ronaldo - showned his appearance. Some of unlucky fans will probably miss 2018 FIFA World Cup opening ceremony live for work, study or other reasons. Instead, to free download 2018 World Cup opening ceremony full show from YouTube and alike eanbles you to watch the grreat ceremony whenever and wherever with no limitations. It is no doubt that Russia 2018 World cup opening ceremony videos will be shared on YouTube, sports channels and other online video streaming services or even SNS. To download those videos, an expert online video downloader is essential. WinX YouTube Downloader, was originally developed as a qualified tool to free download YouTube videos and later becomes a more powerful program available to save all videos offline from 300+ sites, including popular sports channels, like ESPN, Fox Sports and more. Based on qualities of video source online, it can download Russia 2018 World Cup opening ceremony full show video in 4K UHD, 1080P Full HD, 720P, 480P, 360P to MP4, FLV, 3GP and WebM. The resulting video will keep lossless quality with vivid images and hi-fi audios. Thanks to Multi-thread and Multicast tech, it can download a video at a 5-8x faster speed. What's more, it has a clean installation pack without any mailicious extras and no ads or other annoying stuffs adhered on the interface. Therefore, you can use it without worrying about security at all. After that, please follow the steps below to free download 2018 FIFA World Cup opening ceremony full show. Step 1. Launch WinX YouTube Downloader and click +link-shaped button. Step 3. Seconds later, video info (title, duration) and a list of video versions are shown. Select 1920x1080 MP4 version and click OK. Step 4. Define a new folder as target folder to save downloaded video if necessary. 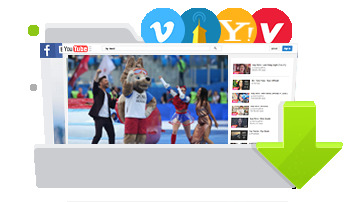 At last, click RUN button to start downloading Russia 2018 opending ceremony video. 1. The green Convert video button next to Download enables you to get the most efficient solution to change the format of saved video to another one. 2. WinX YouTube Downloader is also available to download music videos, movies, TV shows and other videos in 4K/8K/HD/SD/3D/VR with ease. 3. The software developer does not advocate downloading copy-protected videos from YouTube for any commercial purpose and suggests referring to "Is it legal to download YouTube videos" before doing so. WinX HD Video Converter Deluxe - Download and convert FIFA World Cup opening ceremony videos and other hot videos from YouTube, Vimeo, Dailymotion and other 300+ sites to AVI, MOV, WMV, Apple/Android/Windows deivces with original image in a flash.